The first bite brought in a loud crack and crash. This was followed by a gradual deterioration of the solidity of the Crisp, but it still maintained its crunchiness until around two thirds in, when it began to turn mushy. For some reason these Kettle Cooked Crisps were not as irregularly shaped as some. There were some bends and curls but most were just gently wavy in shape. Most of the constituents in our test bag were whole. There were also plenty of oil boils. The most stand out feature however, was the colour. They were actually a rather scary looking orange. They really did look like Kettle had put some effort into the seasoning. We were hoping for a little nuttiness provided to us by the Porcini Mushroom, but we could not detect it among the sweet Paprika flavouring. 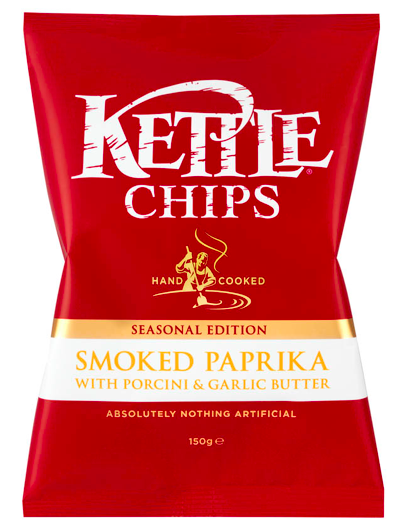 The Paprika was mild and there was certainly a butteriness to the combination.